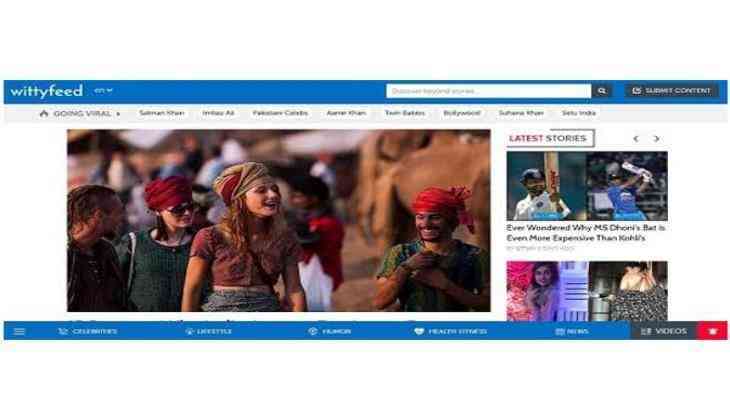 WittyFeed, World's second largest and India's largest content marketing company has rebranded itself and launched a new user interface. The brand also relaunched its logo, tagline and its look and feel keeping the new vision and brand philosophy in mind. WittyFeed, as a platform has been a pioneer in creating content that is engaging, interactive and has helped various brands by its subtle integration, allowing them to reach its target audience in the best possible formats. The new version of WittyFeed modeled on the philosophy of "beyond" truly depicts the same in its new avatar. New WittyFeed, apart from being a mere content platform, will showcase thoughts which are "beyond stories". The upgraded version of WittyFeed will also get to see a new logo and an even more exciting website. The old version of WittyFeed website has been there since the inception of the company in 2014, but WittyFeed has been upgrading the interface and technology as per the market needs time to time. Now the brand has decided to revamp the complete UI ( User Interface) by acquiring the latest yet futuristic modalities to empower the brands to communicate with its target audience in a more interactive manner. Highlights of new features on WittyFeed for a seamless user experience are Dedicated video section, Going Viral (for latest topics that are going viral on WittyFeed), Bell Icon (for subscription option for them to get news delivered in their inbox/browser), Floating yet Fix Menu Bar (for a better discovery of trending categories), Clean Rich Media Banner (for a better exposure for brands). "We have been all ears to our users and advisors and have been receiving constant feedback on the frontend and backend admin, in this new update we have made sure to adapt newer modalities which will not only help users discover more content but also would be allowing brands to engage with the TG in best possible formats. The new Logo, UI and brand punch line is been designed keeping in mind the continued vision and goal to deliver everything beyond! We are very excited to revamp ourselves," said co-founder and CEO WittyFeed, Vinay Singhal. "Now brands and agencies will have two edge advantage - from the content perspective and campaign virability perspective. In terms of the content - We believe that this rebranding will definitely enthrall our audience with its rich content and enhanced user interface introduced," added Vinay. In terms of campaign virality, we have adopted newer technologies which would further help brands track their campaigns in a more efficient way. With our already existing platform and analytics gathered over past few years, we are sure to get more engagement and help in discovering the content that is trending on the internet and deliver a beyond experience." WittyFeed is the World's second largest and India's largest content marketing company on the globe. From its inception in 2014, it has been providing the means to discover the world of stories. Unearthing a world full of possibilities beyond your limits using vivid imagination, stories and videos just for you! It is headquartered in Indore (India) and was founded by Vinay Singhal (CEO) along with two co-founders, Parveen Singhal and Shashank Vaishnav, as Vatsana Technologies.